The seasons technically changed a few weeks ago, but let’s be honest: Marathon Monday is the unofficial kickoff to spring in Boston. Forecast aside, this year is no exception. The 123rd annual Boston Marathon on Monday, April 15 will herald the beginning of patio season—if the weather cooperates, of course—and restaurants across the city get pretty festive for the day. So whether you want to fuel up with fun breakfast sandwiches, do some bar-hopping, or carb-load in support of runners (yeah, that’s it! ), here are the best Marathon Monday deals and specials to help you plan your day. Whether you’re running or not, celebrate the marathon with a carb-loaded meal. Bistro du Midi is running two pasta specials that fit the bill, thanks to executive chef Robert Sisca, who is himself an aspiring marathoner running his first half-marathon later this spring. Stop in for his black pepper tagliatelle, or whole wheat cavatelli with duck Bolognese, apple, and feta. Opens at 11:30 a.m., 272 Boylston St., Boston, 617-426-7878, bistrodumidi.com. Opens at 7 a.m., 528 Commonwealth Avenue, Kenmore Square, Boston, 617-532-9100, easternstandardboston.com. Eventide will open an hour early in honor of the holiday, starting at 10 a.m. 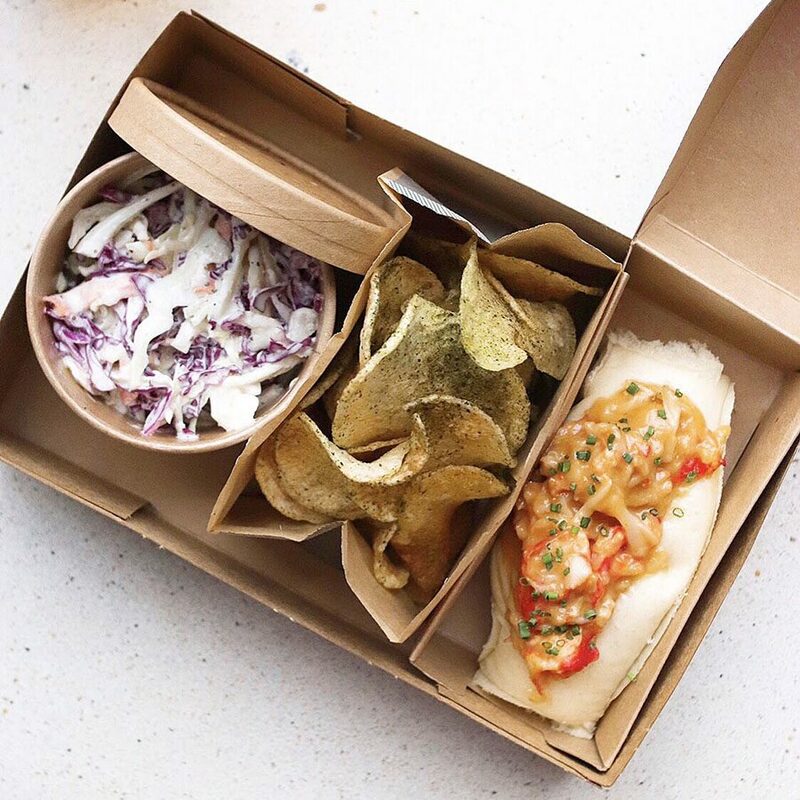 Check out brunch specials, as well as the new Red Sox game day deal: a brown butter lobster roll, chips, and a choice of either kimchi or coleslaw for $19. On Marathon Monday, there will be a selection of $1 oysters all day, and Eventide will also launch its new loyalty program, the Oyster Eaters Club, with giveaways and more festivity. It’s a great day to drop into Fenway. Opens at 10 a.m., 1321 Boylston St., Fenway/Kenmore, Boston, 617-545-1060, eventideoysterco.com. This iconic Back Bay steakhouse opens early for the marathon to serve a special lunch menu from executive chef Peter Agostinelli. You’ll find a dry-aged beef and Wagyu burger, lobster rolls, and more. Marathon Monday is also the only day of the year when the chophouse serves a lunchtime special rigatoni Bolognese—because, you know, carbs. Dinner service will start at 4 p.m.
Noon-3 p.m., 161 Berkeley St., Back Bay, Boston, 617-542-2255, grill23.com. 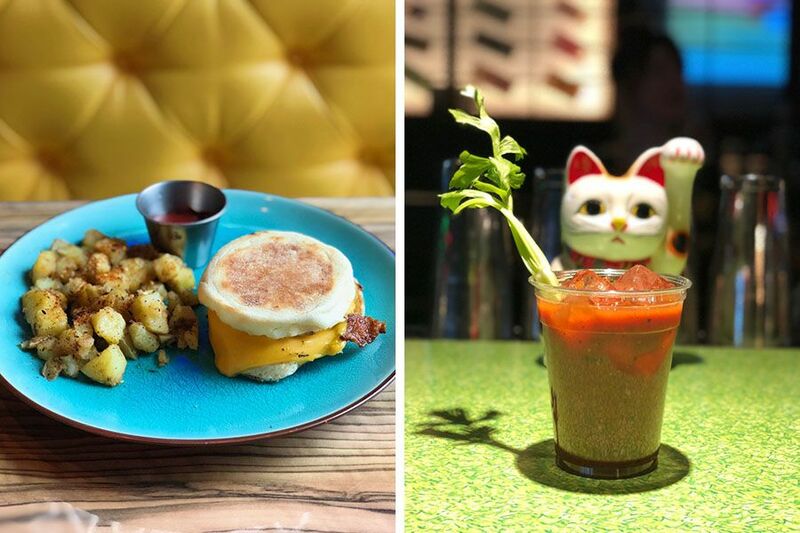 As is tradition, there’s also a Red Sox game on Monday morning, so this funky, Fenway-side izakaya is a smart choice to hang, starting at 9 a.m. The crew gets heavy into spirit of things: Marathon Monday is the only day they roll out Bloody Marys. So stop in for a drink and a breakfast sandwich—like a classic bacon, egg, and cheese on a croissant, served until noon—and then take a short stroll to the race route to cheer for runners, or just stay here to root on the home team. Opens at 9 a.m., 1271 Boylston St., Fenway/Kenmore, Boston, 617-670-0507, hojokoboston.com. If you’re more into drinking marathons than running marathons, you’re in luck: Framingham brewery Jack’s Abby is throwing parties at six bars along the Boston Marathon route, highlighting the seasonal return of their refreshing Blood Orange Wheat Lager, along with giveaways and marathon updates at every stop. If you’re feeling adventurous—and, of course, have a designated driver—hit all the parties: You would start at Central Public House in Hopkinton, and end at Dillon’s in the Back Bay. Various times and locations, jacksabby.com. The Newbury Street location of this local chain is the perfect place to fuel up before watching the marathon. It opens at 7:30 a.m. with breakfast specials and coffee, including some morning cocktails like Bailey’s Almande Cold Brew. While you’re there, be sure to write a quick message on the “Thank You Mural,” for first responders working through the race—they’ll get a private thank-you breakfast at Joe’s on Tuesday morning. Opens at 7:30 a.m., 81 Newbury St., Back Bay, Boston, 617-536-4200, joesamerican.com. This country bar opens early on Marathon Monday—right across the street from Fenway Park. Come for giveaways, patio seating, and live music. The regular menu and a limited brunch menu all await, as well as a build-your-own Bloody Mary bar and special marathon-themed cocktails. Plus: Loretta’s is one of the Lyons Hospitality Group’s 14 restaurants serving up a special Electric Lemonade cocktail, that honors the legacy of beloved, former employee and Summer Shack server, Krystle Campbell, one of the victims of the 2015 Boston Marathon bombings. Lyons Group venues all around Boston are partnering with Tito’s Handmade Vodka to raise funds for the Krystle Campbell Memorial Fund through sales of the charitable drink, available through April 30. Opens at 8 a.m., 1 Landsdowne St., Fenway/Kenmore, Boston, 617-421-9595, lorettaslastcall.com. Located just past the finish line at Copley, Oak Long Bar (and its cool patio) is a prime place to grab lunch on Monday. 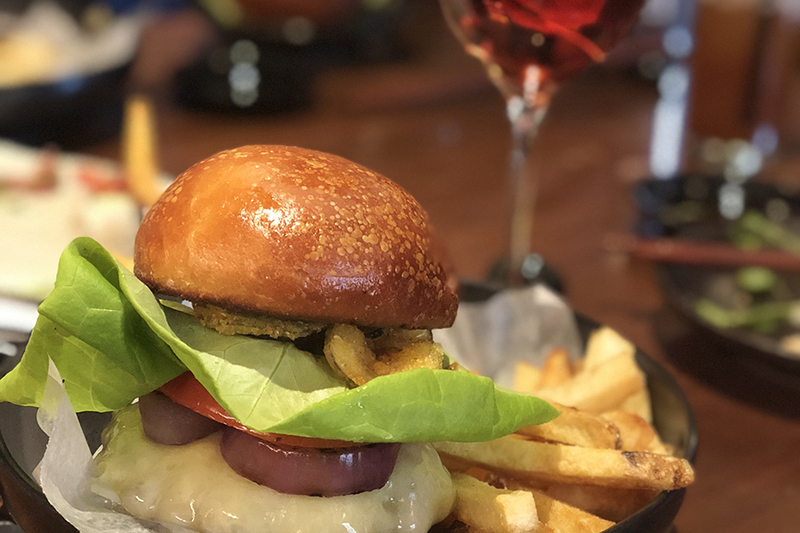 There are a few burgers on special, including the $15 “Winning Combo” of a single-patty cheeseburger and a draft pour of 26.2 Brew, a light, hazy golden ale brewed with Himalayan sea salt and coriander, created by marathon runner Shelley Smith and Boston Beer Company, the folks behind Sam Adams. Opens at 11:30 a.m., 138 St. James Ave., Back Bay, Boston, 617-585-7222, oaklongbarkitchen.com. This excellent outdoor dining spot is pretty much leaping-distance from the finish line, with a menu by star chef Jody Adams. 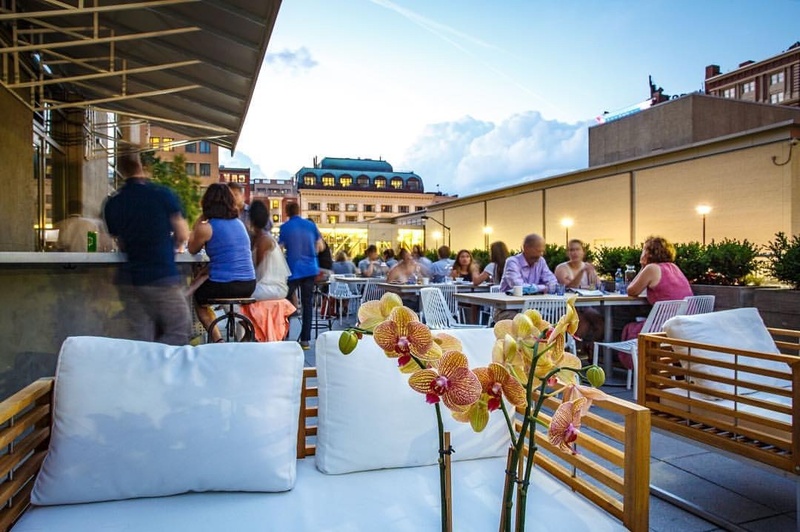 The Copley spot will be serving roasted oysters for $1 all day long—plus (weather-permitting) glasses of bubbly and spring cocktails on the patio. It’s free to attend the marathon party, but RSVPs are requested to ensure oyster availability. 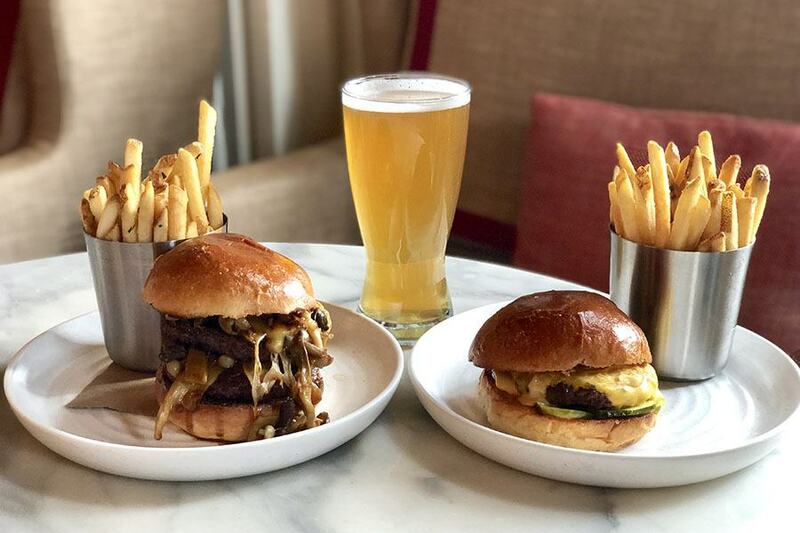 There are plenty of day-drinking options on Patriots’ Day, but there’s good reason to choose Trillium: Marathon Monday is the grand opening of the new restaurant’s highly anticipated roof terrace. The third-level bar and lounge offer views of the brewpub’s street-level patio, and more of downtown Boston. On Monday, enjoy handcrafted pretzels from chef Michael Morway, made in collaboration with local farm, mill, and bakery One Mighty Mill. The two companies also teamed up on a locally grown wheat ale, which will debut on Monday in Boston as well as at Trillium’s Canton location. Opens at 11 a.m., 50 Thomson Place, Fort Point, 857-449-0083; 110 Shawmut Road, Canton, 781-562-0073, trilliumbrewing.com. Marathon Monday offers a great chance to check out the spot that tops our list of the best restaurants in Boston: It’s the only day of the year Uni offers lunch service. Acclaimed chef Tony Messina’s menu will feature the limited Uni burger, a beefy blend of short rib, brisket, sirloin, bone marrow, bacon, and dehydrated miso, with decadent toppings on a house-made potato roll; as well as the signature Uni spoon, a full selection of handrolls, nigiri, and more hot and cold small plates. Weather-permitting, there will be seats on the sidewalk along the route on Comm. Ave. After lunch, the bar reopens at 5 p.m. and regular dinner begins at 5:30 p.m.
11:30 a.m.-2:30 p.m., 370 Commonwealth Ave., Back Bay, Boston, 617-536-7200, uni-boston.com. 26.2 sounds like a large number when it’s miles to run—when it’s what you’re paying for a three-course meal, however, the sum is attractively modest. On Marathon Monday, the Royal Sonesta Hotel restaurant will offer a “Boston Marathon Recovery Meal” for $26.20 per person: Start off with minted pea soup or Korean-inspired chicken wings, then choose from five sandwich options for the main course. For dessert, cheesecake is always a winner, but if you’re looking for something lighter after a long day of running (or cheering), there’s also sorbet. Opens at 11 a.m., 490 Edwin Land Blvd., Cambridge, 617-806-4122, artbarcambridge.com. Hey, runners: Want a tasty reward for your efforts? 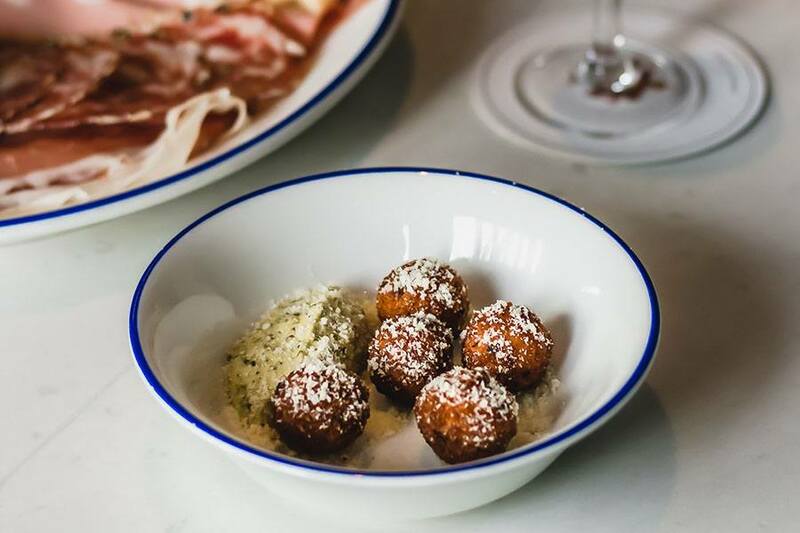 Show your 2019 medal and get a complimentary arancini snack from chef Colin Lynch at this coastal Italian stunner in the South End. Opens at 4:30 p.m., 360 Harrison Ave., South End, Boston, 617-530-1770, barmezzana.com. Have fun and do good in the South End at the sixth annual fundraiser for the Gillian Reny Stepping Stone Center for Trauma Innovation, which was established by the family of the marathon bombing survivor. There’s no cover to enjoy a complimentary Champagne toast, and all proceeds from the sale of specials like roasted beets with labneh and pomegranate, duck breast with blood orange and pistachio, and small-batch craft brews from Hopkinton’s Start Line Brewing Co. benefit the trauma research and recovery fund. 3 p.m.-midnight, 541 Tremont St., South End, Boston, 617-423-0069, beehiveboston.com. Celebrity pastry chef Christina Tosi loves Boston, and of course her company is celebrating its first Boston Marathon in the area. From now through Patriots’ Day, corn cookies are buy-one-get-one-free—share with a friend, or carbo-load with both. After the race on Marathon Monday, marathon participants can bring in their medals to receive a free, post-race soft-serve. Because you deserve it after 26.2. 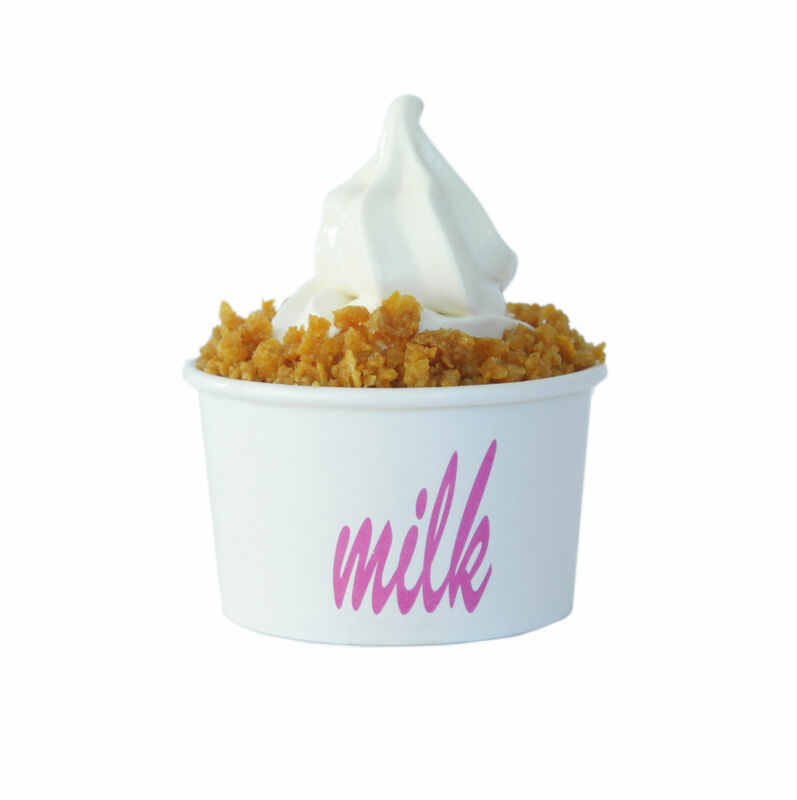 Opens at 7 a.m., 3 Brattle St., Harvard Square, Cambridge, milkbarstore.com. Whether you ran the race or not, this Seaport spot could be a good spot to kick back afterwards, away from the crowd. If you did run, congrats! Show off your medal to score a $16 burger and a Prime Margarita, made with elderflower and agave nectar. Opens at 11:30 a.m., 140 Seaport Boulevard, Boston, 617-670-1345, ocean-prime.com.